I'm not sure why I waited so long to play with the Stitched All Round stamp set and coordinating Framelits. 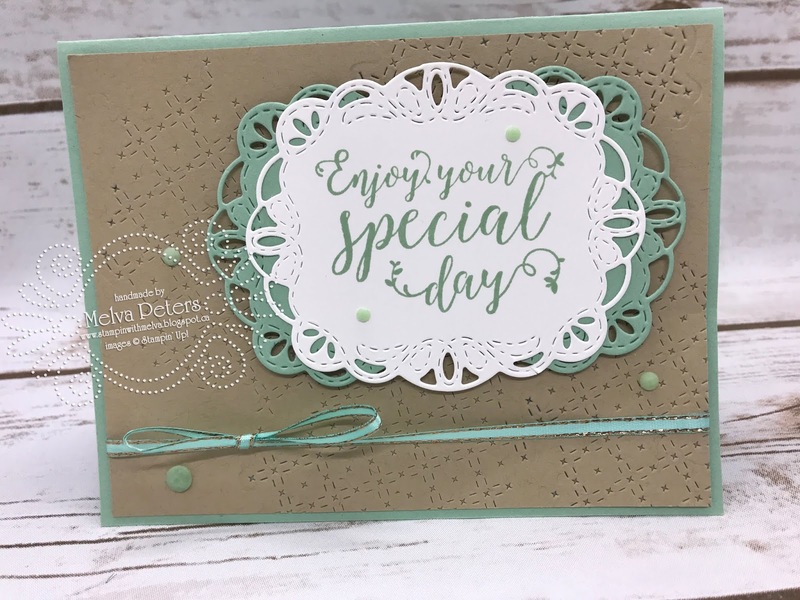 I just love how easy it is to make a beautiful card with this bundle! The card I'm sharing uses the bundle to make a pretty card. I'm loving the combination of Mint Macaron and Crumb Cake! Can you see the texture on the Crumb Cake? It is made using one of the Framelits - that piece doesn't cut out a shape, but makes an amazing impression that is perfect for a background. I randomly placed it on the Crumb Cake card stock to make the background pattern. For the main sentiment pieces I cut two of that shape out - one in Whisper White with the sentiment stamped on it and the second in Mint Macaron. I cut the Mint Macaron piece in half and adhered the two pieces to the sides of the sentiment piece.